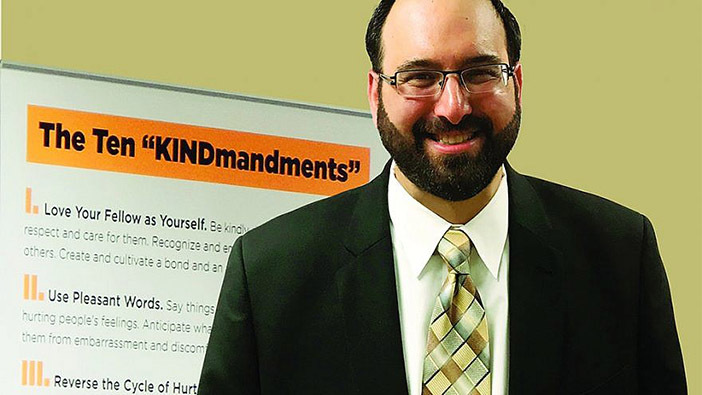 Rabbi Tzvi Muller reveals a “10-step program” (“Ten KINDmandments”) to bring about a boost in learning and living with benevolence. Twenty years ago, Detroit-area Rabbi Tzvi Muller, at the time a yeshivah student in Israel, had a chance encounter on a Jerusalem street that shook up his Jewish conceptions—and forever altered the course of his life. This brief conversation with a random stranger sent Muller on what has turned out to be a decades-long quest to enhance the way Judaism’s Golden Rule—to “love your neighbor as yourself”—is understood and applied in everyday life. On that day, Muller met a backpacker who did not particularly look Jewish. He learned that the young man’s aging mother had recently revealed to him that she was, in fact, Jewish and a Holocaust survivor. In response, the shocked and baffled son journeyed from Montana to Israel to see if he could, in any way, connect with his newly discovered Jewish roots. So far, he had come up empty. After explaining his desire to learn about Judaism, the backpacker asked Muller, a New York-born rabbinic student and himself the grandson of Holocaust survivors, what he had been studying that day in yeshivah. Muller was crestfallen. His class had spent all day learning how to distinguish which spots on an etrog made the lemon-like fruit unfit for ritual use on Sukkot. But, he thought, how could these super-specific details be meaningful to a man who knew absolutely nothing about Judaism? The young man left, feeling greatly enlightened. But Muller walked away from the incident profoundly disturbed that he had nearly missed an opportunity to inspire someone about the richness of his Jewish heritage. “I went to my rabbinic mentor, who encouraged me to do research,” related Muller. “What I discovered blew my mind. While in Israel, Muller raised funding and organized a team of scholars who produced a seven-volume encyclopedic work in Hebrew on the Jewish teachings of interpersonal relations. But he realized that he had a much harder task ahead of him—to make this knowledge accessible to all Jews—not only to scholars, but also to those who cannot even read Hebrew. “This is their heritage, too,” he thought. Thus arose Muller’s mission. And he’s continued this quest by teaching about kindness for the past 11 years in the Detroit metropolitan area, continually fine-tuning the communication of this body of knowledge. Muller created the nondenominational Jewish Values Institute (JVI) in Bloomfield Hills, Mich., as a means to instruct in the ways of kindness, ethics and mindfulness. One goal of his is to get funding to hire a professional curriculum writer to make the coursework accessible to Jewish educators across America and beyond. He recently formulated the “Ten KINDmandments” (in the spirit of the “Ten Commandments”) that provide a summary guide on how to live a life of kindness in interpersonal relations. Respect Others’ Good Will (Don’t seek others’ sympathy or friendship under false pretenses). In addition to directing the Jewish Values Institute, Muller, 42, the husband of Rachaeli and father of six, serves as pulpit rabbi at the nearby Birmingham-Bloomfield Chai Center synagogue. Jerry and Eileen Borsand of Bloomfield Hills are founders of the congregation, as well as the nearby Blumenstein Jewish learning Center, where JVI has offices. “We are very fortunate to have Rabbi Muller because he is an amazing spiritual leader and such a dedicated, sincere and genuine person,” said Eileen Borsand. At JVI, Muller teaches a series on kindness with topics like “Judging Others Favorably,” “Speaking the Truth” and “Bearing a Grudge and Revenge.” Students at his lectures learn the essence of kindness from the ancient texts of Jewish sages, as well as from the rabbi’s sharp wit. “Some things in life come with accompanying instructions, from coffeemakers to our roads with speed-limit signs” explained Muller. “But for the most important areas of our lives—our relationships, our choices about goodness, our own character development—we don’t have signs popping up, giving us guidance what to do. Students of the rabbi agree. For more information, email [email protected] or visit Jewish Values Institute on Facebook. For a laminated copy of the “Ten KINDmandments” with annotations, send your street address to [email protected].